This morning I had an amazing opportunity to meet the director of the National Institutes of Health (NIH). His name is Dr. Francis Collins, and I’m here to tell you that he’s a pretty rad guy! Now, it’s possible that you aren’t familiar with the NIH much less it’s director, but let me tell you that the NIH is a big part of your life. Almost all scientific research conducted in our universities is funded by taxpayer dollars through the NIH. Most of the exciting science breakthroughs you hear about in the US were made possible by the NIH… and if you live here that means it was funded by YOU. Basically, in addition to paying my stipend (thanks guys!) you also fund pretty much all the research conducted in our country’s academic labs. 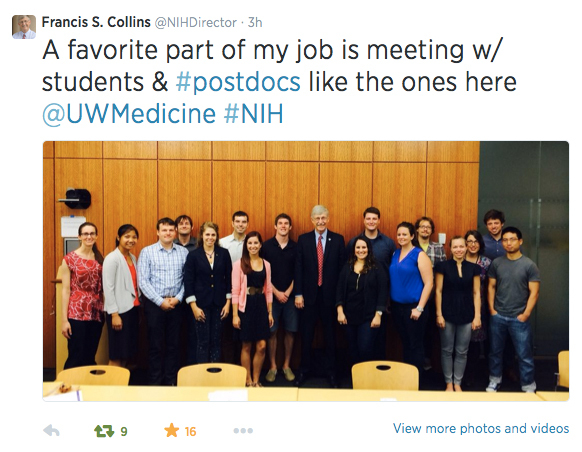 Likewise, Francis Collins might not be a familiar name to you but I guarantee you’ve heard of his work. He oversaw the Human Genome Project, one of the major biological advancements of our lifetimes. So, you know, he’s kind of a big deal. Once he and his posse finished mapping our DNA, President Obama was like, “soooo you’re kinda smart, think you could run the largest biomedical research funding agency in the world for me?” And Francis was like, “yeah ok.” So that’s how we got to where we are now. So anyway, I was invited to join this round-table discussion with 15 other PhD students and postdocs. We were welcomed to ask Dr. Collins anything about the future of NIH research, but we only had an hour. I can’t quote anything exactly, but I will do my best to convey his answers to you as accurately as I can remember. Question #1 – What are your thoughts on the budget crisis? Answer: He thinks that although we are in a tight budget squeeze right now, it is going to be temporary. In the late 90’s the NIH budget apparently doubled, and it was an awesome time to do research. Now, however, amid budget cuts (and the sequester, and the shutdown, etc) we are stagnating and the field is suffering. All the more reason to advocate for biomedical research funding on Capitol Hill. Part of his trip to Seattle was to meet with WA Senator Patty Murray, and he jokingly suggested we all send her flowers because she’s supported research funding very strongly. Regardless of your political viewpoints, I think as a species we can agree that medical research is important to everyone. He did emphasize his belief that things will get better and although the current situation feels dire it will not last forever. I hope he’s right! Question #2 – We have too many trainees for too few jobs. How is the NIH dealing with this? The idea that going to industry is “selling out” is incorrect, and the NIH is expanding their programs to expose trainees to such options. He admitted that it was still a small operation, but that he hopes it will grow soon. For example, there is the Broadening Experiences in Scientific Training (BEST) program. It’s nowhere near enough, but it’s a start in the right direction. Answer: Bringing equality for women (as well as minorities) is a big deal for the NIH. He acknowledged that there is a clear bias toward white men and even cited papers that studied the phenomenon. He said that the NIH has bias-training requirements and that they are very conscious of such things on review and selection committees. For minorities, they are trying to implement and expand a nationwide mentorship program. Overall, though, he pointed out that it is not a problem specific to just the NIH and no matter how many programs are implemented to prevent discrimination it’s something that we as a community (as well as a culture) need to work on together. Tenure committees at universities need to be better about promoting women and minorities, professors need to be better at hiring under-represented groups, etc. It’s a team effort and we’ll all need to strive for equality together. Question #4 – (my question) The issue of hypercompetitiveness in research has lead to decreased reproducibility because researchers feel they must publish or perish. How can we, as the next generation of scientists, possibly change this system while still remaining competitive in the current landscape? Answer: He very much wants to break the “C.N.S. Syndrome” that is currently rampant in our field… where researchers are only valued if they have published in Cell, Nature, or Science. He specifically said that it was “crazy” for us to think the one-word journals were the only way to be successful, and acknowledged that this mentality has bred a need to publish results that aren’t ready. Additionally, we feel pressured to publish provocative findings before our competitors, and if we don’t succeed we won’t receive the limited funding that’s available. He discussed a sort of “pilot” experiment the NIH has run over the last decade through the Pioneer Award. There were a small number of these grants awarded to scientists with exceptional ideas. Essentially, as Dr. Collins described it, these people come up with a really cool scientific idea or question. Unlike the traditional R01 grant proposal, however, they just explain why their idea is exciting but aren’t required to have extensive preliminary data or outline every experiment and backup plan like traditional R01 grand proposals. Then they’re given money for five years to see what they can do. The idea is to nurture creative scientific inquiry and simultaneously remove the gigantic burden of grant writing. Well over the last ten years they’ve been able to look at the productivity of labs with Pioneer Awards and compare them to labs funded by R01’s (for those who aren’t familiar, R01 is just a type of large research grant for academic labs). As Dr. Collins explains it, these Pioneer labs have performed better and “actually look more like Howard Hughes labs.” So the pseudo pilot has given actual data to suggest this format is better for scientific research and the NIH can see that now. Again, the number of Pioneer Awards is tiny, but it’s a nice start with a solid foundation. He wants to see this type of grant award become commonplace. He said that it’s terrible how the current grants are often written around the question, “What types of experiments can we do? What questions can we answer with those experiments?” rather than, “What’s a really cool scientific question? ?” I really, really loved that he felt this way. He wants to usher us into a realm where scientists don’t have to pander their grant proposals to what they think the NIH wants to see. That won’t help humanity nearly as much as proposals that ask really awesome and interesting scientific questions (however risky they may be), so we need to get back to that spirit. Question #5 – How can we engage the public in science? Scientists are sometimes thought of as bad guys due to lack of understanding or transparency, so how can we get people excited about research rather than fearful? Answer: He wants to know any ideas you might have, actually. He described one current project that should be rolling out in a few months. They’re putting together a huge series of youtube videos by pairing PhD students with film students at the same universities, and together they’ll make short ~3min videos about their research and why it’s cool. They hope that putting a huge library of these videos out there will make those topics more accessible, may possibly create a few viral videos, etc… anything to get people aware of research and interested in what people are doing in labs. Additionally, hes trying to get more social media exposure for the NIH by writing his own blog and having his own Twitter. Finally, he also hopes that people will plug the NIH more often when they make national media for their research findings, so the agency has more public exposure and seems less mysterious. Tooting their own horn is awesome, but also mentioning the funding source could be a nice way for the general public to be more familiar with the NIH and how their tax dollars have contributed. Question #6 – How can we encourage labs to provide 100% open access to all of their data sets? Answer: He recognizes that there are no repercussions for labs that say they’ll make their data available but never follow through. He also realizes that there isn’t a universal and user-friendly database for labs to quickly and painlessly submit their datasets, often causing labs to say, “ugh, screw this.” They’re aware of the issue and working on ideas to solve it, so rest assured. Ideally the system will utilize a format that’s easy for everyone to use, both on the uploading and downloading ends. Also, they’ll need to work out a way to provide server space for things like SNP data, sequencing, etc. All those types of datasets that are inherently gigantic and often expensive, so open access is critical if we hope to prevent labs from re-inventing the wheel. There will also be more accountability in the near future. As it stands, there are no punishments for not sharing your datasets or codes, even if you say you will. Therefore, Dr. Collins is pushing for more rigorous follow-ups during annual R01 reviews to motivate timely and complete data sharing. So there you have it. We had very little time with him, and those were the major points we discussed. I think we covered a really interesting and broad range of topics, and I left feeling very satisfied with his vision for NIH. I admit that I somewhat expected him to be a political sleaze, but I was glad to find he was a well-read scientist at heart. He has been in our shoes, although many years ago, but he at least understands on some level the struggles we experience and the priorities we have. At the end of the discussion he said, “Oh! Can everyone get together for a picture? I want to tweet it!” and pulled out his iPhone right there. It was awesome experience. He is a cool dude. If you have any specific questions about the topics I discussed, please feel free to send me a message and I can hopefully give you more details! I loved the idea of putting PhD students with film students and creating a series. Not only is it a great brand awareness plan, but putting Arts and Sciences together to accomplish greater knowledge is super duper.